Unlike Lightroom, Photoshop doesn't have a grain filter. This tutorial explains how to easily simulate film grain using photoshop layers and the noise filters. Open your image for editing in Photoshop and ensure the “Layers” window is visible as you will need to work with it. If it’s not visible select “Windows | Layers” to display it or alternatively use the shortcut key F7. Add a new layer using the menu “Layers | New | Layer…” This will display the New Layer dialog as shown below. 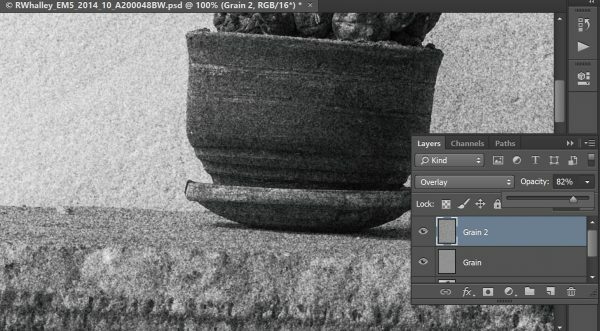 Name the new layer “Grain” and set the Mode to “Overlay” as show in the screen shot above. This causes the “Fill with Overlay-neutral color” checkbox to become active at which point it should be clicked to select it. You can then click the OK button to add the new layer which you should then see in the Layers window as illustrated below. Ensure the Grain layer is the currently selected to layer you are working on so that the next change is applied to that layer. From the menu select “Filter | Noise | Add noise…” This will display the Add Noise dialog as shown below. In this Dialog select the Gaussian distribution so that the noise doesn’t appear to have an obvious pattern. Also ensure the “Monochromatic” option is ticked otherwise there will be unwanted colour noise. 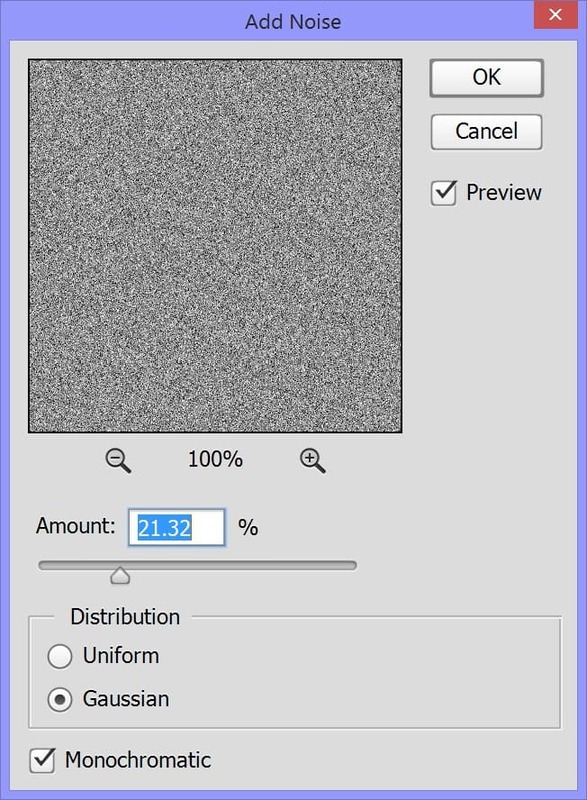 Increase the Amount slider until you can see a suitable level of noise present in the image. It’s this noise that will be used to simulate the film grain although at this stage it’s looking a little too harsh. It’s also a good idea to have your image zoomed to 100% magnification so that you can better judge the noise levels. You can see a screenshot below to illustrate. The next step is to slightly blur the noise which will soften it so that it takes on the appearance of film grain. This is done using the “Gaussian Blur” filter. 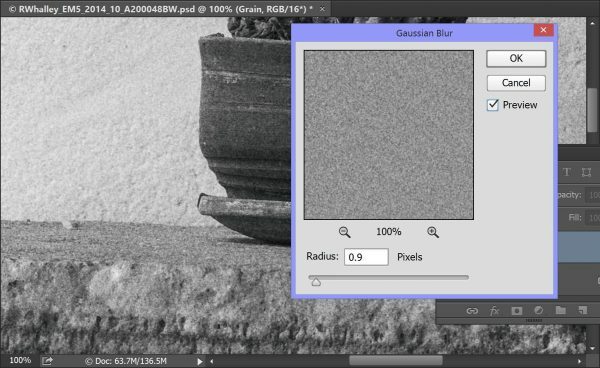 From the menu select “Filter | Blur | Gaussian Blur…” which will display the dialog box as shown below. Adjust the level of blur to achieve the desired level of grain softening. In the example above a value of 0.9 was sufficient. Consider adding multiple Grain layers which can use varying Noise “Amount” settings. The different layers can then be blended using the Opacity setting of the layer. 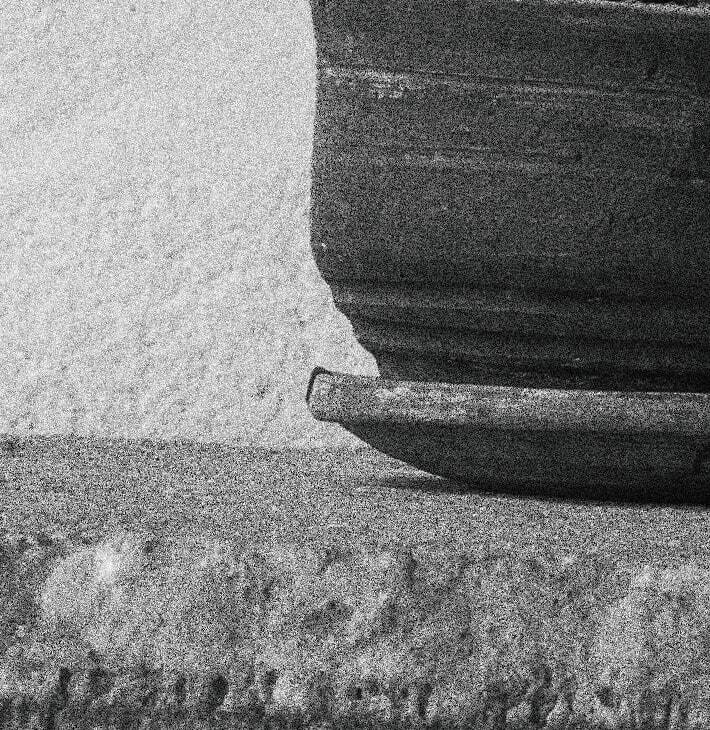 In the next screenshot you can see two Grain Layers have been used to achieve a much heavier grain effect. In this example we have chosen to use the Overlay blending mode for the grain layers. The reason for this is that it doesn’t affect the luminosity of the image. You can though simultaneously darken or lighten an image by using a different blending mode. In the following example the “Multiply” blending mode was used to add grain and darken the image. We could also have lightened the image using the “Screen” mode. 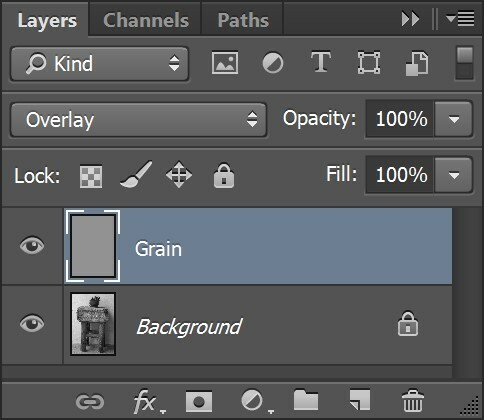 If you use this option be sure to select the blending mode when the layer is created, before you add the film grain effect. You can’t change blending modes later. 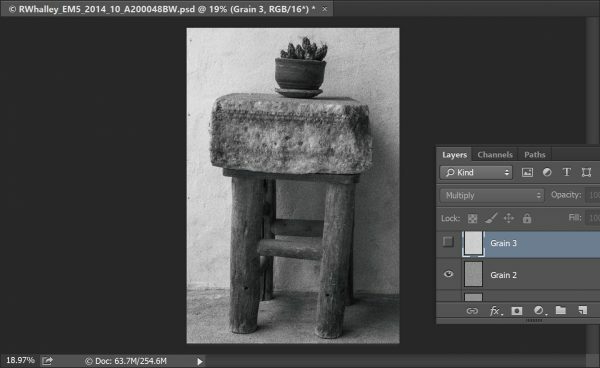 An alternative and simpler approach to simulating film grain in Photoshop is to use the Camera RAW filter as a layer. Learn more about using Photoshop with my Layers and Masks books. I find this a very good approach, anyway I prefer the look of PsdFilm, which uses real scanned film grain. You can find a post in their site comparing digitally generated grain vs. scanned film grain. Thanks. I haven’t come across their site before. They appear to have some interesting actions. You can also improve on the simple example here by combining it with Luminosity masks. This gives much greater controle over how much grain is applied to each tone as you would expect with film.